Unsolicited: When viewing the profile of any of your first-degree connections, a Recommend link is displayed when you click the drop-down arrow next to the Send a Message button in the middle of that person’s profile. By clicking that link, you can give an unsolicited recommendation. Requested: You can request recommendations from your first-degree connections. You might send such a request at the end of a successful project, for example, or maybe ask for a recommendation from your boss before your transition to a new job. 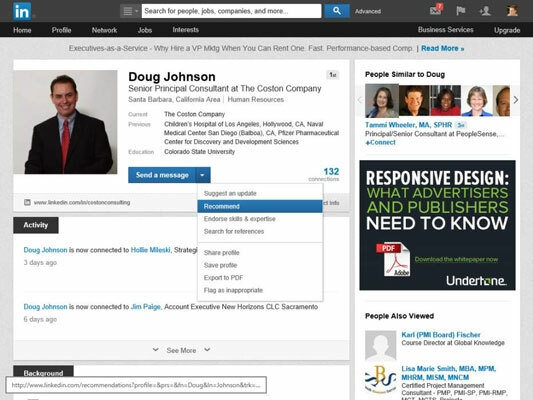 Reciprocated: Whenever you accept a recommendation from someone, LinkedIn gives you the option of recommending that person in return. Some people do this as a thank you for receiving the recommendation, other people reciprocate only because they didn’t realize they could leave a recommendation until someone left them one, and some people don’t feel comfortable reciprocating unless they truly believe the person deserves one. You decide in each circumstance whether to reciprocate, because there are circumstances where that might be awkward, such as if you get a recommendation from a supervisor or boss. After the recommendation is written, it’s not posted immediately. It goes to the recipient for review, and he has the option to accept it, reject it, or request a revision. So even though the majority of recommendations you see on LinkedIn are genuine, they’re also almost entirely positive because they have to be accepted by the recipient. 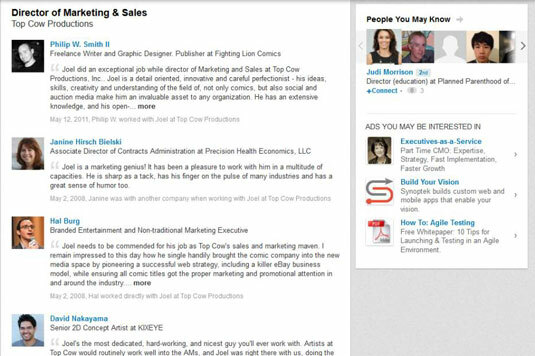 LinkedIn shows all recommendations you’ve received as well as links to the profiles of the people who recommended you. This provides that social validation you want by allowing people to see exactly who is endorsing you. The quality of the recommendations matters as well as who they’re from. Five very specific recommendations from actual clients talking about how you helped them solve a problem are worth more than 50 general recommendations from business acquaintances saying, “I like Sally — she’s cool,” or “Hector is a great networker.” And any recommendations that heartily endorse the number of cocktails you had at the last formal event probably need revision.